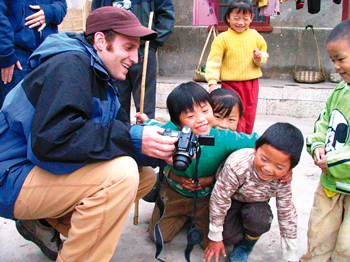 In 2005, American Mike Levy touched down in Chengdu, China as a Peace Corps Volunteer. Posted to Guizhou University for two years, he kept a blog to process his new experiences in China. At the end of this year, these experiences will be published in a book titled Kosher Dog Meat (Henry Holt). Asian Jewish Life sat down with Levy to discuss what it meant to be a Jew in the interior of China, far from the expat comforts in the coastal cities. Asian Jewish Life: KOSHER DOG MEAT is a great title. What does it mean? Mike Levy: Kosher Dog Meat is about living as a Peace Corps Volunteer in western China. More specifically, it’s about living as the only Jew in a province of 40 million people. Most of my friends and colleagues at Guizhou University knew a bit about Judaism, and a bit more about the western world in general, but there was lots of room for us to stumble through some miscommunication. During my first year in Guiyang, for example, a local dog eating festival coincided with Christmas. A lot of my students wanted to work to combine the holidays so we could all celebrate together. I explained to them that I had little interest in eating dog, and even less in Christmas. This caused something of a scandal. “Americans celebrate Christmas,” they insisted. Christianity and America were as linked in their minds as Communism and China are linked in the minds of many Americans. So it was that I was invited to play Santa Claus in the city’s Walmart. As for eating dog? I told my students about the laws of kashrut in an attempt to avoid participation. One of my more creative students told me she would buy me dog meat from Walmart. She assumed that as a western store, it would carry kosher versions of dog (and everything else). A Jewish Santa Claus eating “kosher” dog meat? It was one hell of a Christmas. AJL: You join a prestigious group of Peace Corps Volunteers who have written books about China. How does yours differ? ML: I should start by saying that one of Peace Corps’ main goals is to create alumni with a life-long commitment to building bridges between their local communities in the United States and the communities they served as volunteers. I think it’s this goal that drives so many PC alums towards writing, and I have tremendous respect for previous writers. I just finished reading Pete Hessler’s new book on China and it’s his best yet. As for Kosher Dog Meat, I think it’s a much more light-hearted book than some of the others I’ve read. I spent most of my two years somewhere in between a state of hilarious laughter and total confusion. The other big difference: as far as I know this is the only book written by a Peace Corps Volunteer that includes Communist Party officials praising the author for his distant relationship to his “Jewish brother” Karl Marx. AJL: Do you keep kosher? ML: Yes! Or Kosher-style, perhaps, since I eat when I am a guest in another person’s home, regardless of what they’ve cooked. It’s hard to be a 21st century Jew. I can’t help but think of Jonathan Safran Foer’s recent book, Eating Animals. What should we be eating? What is healthy? What is moral? What connects us to people and to our history and traditions, and what creates distance? I think about these questions quite a bit. 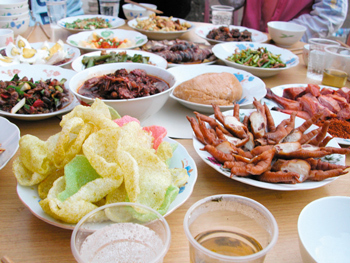 While I was living in Guiyang, I ate whatever I was served. I wanted to be as fully integrated into my community as possible, and eating (and drinking! 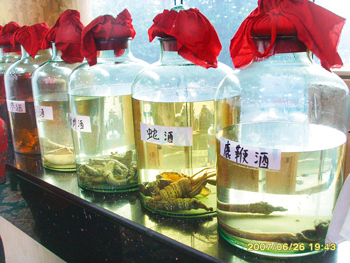 Holy crap I downed a lot of baijiu!) was the primary ways for me to show my respect. Peace Corps is pretty good about training its volunteers to engage in listening and learning rather than lecturing and imposing. I knew I couldn’t go to a place half-way around the world and have any answers. Instead, I tried to immerse myself in my community; I learned far more from China than the other way around. And in that spirit I ate pork. And scorpion. And dog. And they were all pretty yummy. AJL: Compared to the other Peace Corps Volunteers in China, do you think your experience there differed because of your Judaism? And did your Jewish identity change as a result of your experience in China? ML: If American culture and Chinese culture are two parts of a Venn diagram, Judaism might be the strange portion where they overlap. In the politically conservative environment of Guiyang, my hosts would often nod happily when I told them I was Jewish. Marx and Einstein were the only other two Jews they knew, so I was in good company. My Judaism also assured them that unlike the other handful of foreigners in town, I was not a missionary. Judaism was sort of like a grappling hook I could use to get over the Great Wall of Chinese culture. My Jewish identity did change during my time in China. Back home in Philly, I went to synagogue every morning before heading off to work. Jewish holidays were happy, family affairs. But all of this disappeared for two years. For long stretches of time, I felt spiritually isolated. In order to survive, I had to find other ways to get by. Baijiu helped. But beyond drunken banquets, I realized that all I really needed to feel spiritual was a nice long walk, a quiet evening with friends, and some way to connect with family (even if it’s digital). AJL: Did you have a favorite Jewish holiday before you moved to China? If so, what was it? How did you spend it in China? ML: My favorite night of the year, every year, is the first night of Passover. I’ve been hosting a Seder for years and I carried this tradition into Guiyang. I hosted one Seder for fellow Peace Corps Volunteers, and one for my Chinese friends. In both cases, I was the only Jew, but that didn’t really seem to matter. One of my Chinese teachers taught me a phrase, 內外有別, which basically means China treats insiders and outsiders differently. This phrase was definitely in operation in Guiyang—everyone was friendly, but foreigners were kept at an arm’s length. It took me more than a year to really get past nei wai you bie, and part of what helped me do it was a sort of holiday exchange. During the holidays (both Chinese and Jewish), the phrase crumbled away. I shared Passover with my students and they reciprocated by inviting me to their homes for Spring Festival. We both opened ourselves up to something new, and as a result politics, stress, and difference receded into the background. AJL: When people you met in China learned you were Jewish, had most heard of Judaism? Did you find yourself teaching Judaism 101? Or did you find yourself trying to dispel Jewish stereotypes? ML: Judaism was fairly two-dimensional in the minds of most Guizhou residents, though they knew more about my culture than I knew about theirs. Before arriving, I had never heard of the Bouyei, the Miao, or the Dong, three of the ethnic groups that made up about half of the province’s population. My friends and hosts were usually glad to hear that I, too, was an ethnic minority, especially one from such a clever, wealthy group. (Sadly, these Jewish stereotypes seem global, and I often had to brush aside assumptions that I was a banker, that I was as smart as Einstein, or that I was as red as Uncle Karl). I never brought Judaism up myself, but it came up with surprising frequency. In some cases, this was because the folks in Guiyang were so used to Christian missionaries that they assumed I must be yet another arrogant American come to spread his strange ideas about God. To cut through this, I would usually say I was Jewish. My hosts would usually be relieved to hear this. In other cases, Judaism came up because my students were genuinely curious about what it’s like to live in a country and culture imbued with overt religiosity. Maoism certainly took on the trappings of a cult, but kids in Guiyang today don’t even have that to lean on. A lot of them expressed a sort of existential crisis one wouldn’t expect from an 18 year old. They were searching for a set of values in a world that was quickly changing and not having much luck. Buddhism? Gone. Confucius? Abandoned. Communism? Laughable. Maybe the Jewish guy has answers? I could have been the next Jesus! Just kidding. But in all seriousness, there was a lot of curiosity about Judaism and about western belief systems in general. I tried to answer questions as honestly as I could, though I’m sure some of it was lost in translation. AJL: How much did you know about China before you learned you were going there? Did you have an interest in China or Asia before you decided to join the Peace Corps? ML: Before Peace Corps told me I was heading to China, I knew so little about the country, its history, its language, and its culture that I’m surprised I could make any sense of the world. When I arrived in China, I couldn’t even say ni hao, and for months I didn’t know la jiao from hua jiao. AJL: Do you get back to China much? Will you do a book tour in China or Hong Kong? ML: I get back every summer, usually with students from the school I teach at here in America. I desperately miss much of the life I lived in Guiyang, and hope to live in China again as soon as the pieces fall into place. I do plan to do a book tour in both the mainland and in Hong Kong. But this won’t happen until summer of 2011 which feels like a lifetime away. AJL: What does the future hold? Do you plan to write another book?